1) Current Indicator: This blood purifier, unlike other companies units, allows you to set the electric current output to a range between .13 milliamps and .25 milliamps (130-250 microamps) which corresponds to the effective range discovered by Kaali and Lymann when used wrist-to-wrist. A red light comes on when the current is within this range. This spectrum of current is perfectly safe and effective although you can set the current much higher if desired. Not knowing the amount of current applied can lead to irregular side effects from day to day. That is because the higher the current is, the more effects there are, both good and bad. Turning the current up too high can cause allergy-like skin irritations and much more problems with herbs and vitamins due to transfection (the blood cells over-absorption of chemicals). People with sensitive skin especially need this feature so they'll be sure to get the minimal amount of current needed. Having a definite indicator that you are getting the right amount of current is a definite plus for blood purification. Click here to read more on this topic. 2) Frequency Selector: The output frequency can be set via a switch to the frequencies of 4, 10, or 40 hertz. This added feature allows you to adjust the frequency to match the level of transfection-protection that you need. In other words, if at 4 hertz you feel really bad from using the device right after taking your herbal supplements and you want less of that transfection (electroporation) from your treatment, then you can set the control to 10 or 40 hertz. By trial and error you can find the perfect setting for yourself. Since 1997 I have been testing these frequencies on myself, friends, and neighbors and have always had success with them. As Beck said, the frequency is not critical for effectiveness (although he warned about 4 Hz causing "electroporation"). 4) Damped Wave Option: It comes with one extra switch that allows you to select the output waveform, either standard square wave or damped wave. By "damped" I mean that the leading "square" edge of each polarity reversal is rounded off. This prevents the intitial spike of electric current that true square wave outputs cause. The spike makes the output more deadly to microbes but is also potentially harmful to blood cells if usage extends more than the standard two months. The spike is also what damages skin. This extended usage is expected with clients having AIDS. Also persons like myself who easily get reinfected with the Epstein-Barr virus (causing the viral form of chronic fatigue syndrome) and live with an infected person (who will not go through 2 months of treatment to get rid of the virus) need to plan to use the Microbe Electrifier twice a week for the rest of their lives. An added bonus to the damped square wave output is that for treatment against a localized bacterial infection you can turn the output dial even farther to the right for more delivered electric current for more effectiveness. My personal experiences are showing this to possibly be the best way to fight a bacterial infection. This unit is battery powered with a one year warranty. The four 9 volt batteries are not included. Click here to read more about the story behind this device. Click here for blood electrification success stories. 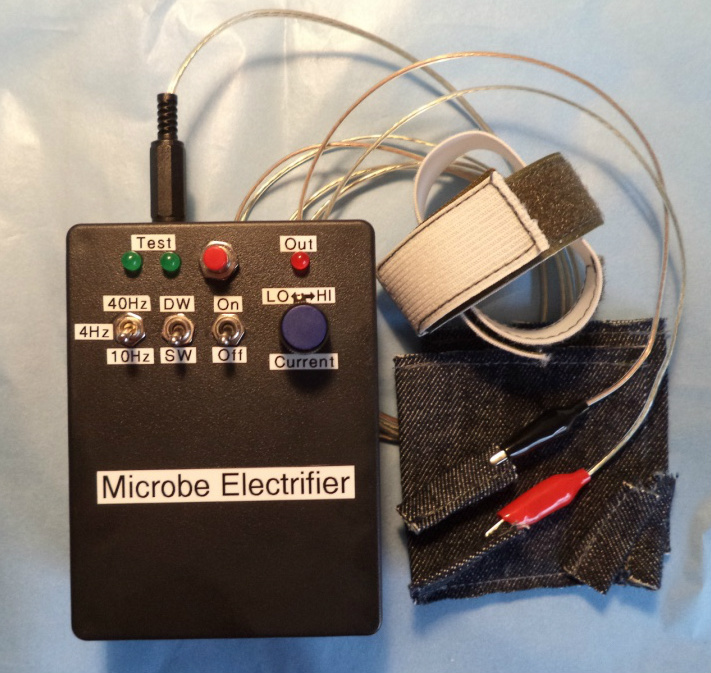 Click here for technical specifications of the Microbe Electrifier. Click here for questions & answers about Beck blood purification. Click here for safety issues. Click here for usage instructions. Click here to read about the Beck Protocol.